You don’t need us to tell you that a dollar just doesn’t buy what it used to, but here’s some actual proof about just how weak the greenback has recently been. With just over a week left to go in the month, the US Dollar Index is already down more than 1.7% on the year. That’s a pretty big decline for a currency, but if you remember last year, the US Dollar Index kicked off 2017 with a decline of 2.6% in January, in what was its worst opening month to a year since 1987. 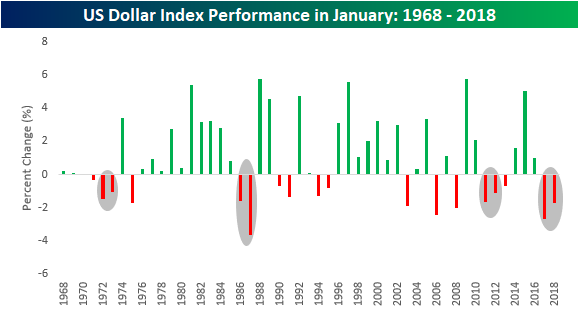 The chart below shows the US Dollar Index’s historical returns for the month of January going back to 1968. As shown, the back to back 1%+ January declines has happened just three other times. The other three periods were 1972 – 1973, 1986 – 1987, and 2011 – 2012. Below we have provided charts of the S&P 500’s performance in the second year of each of the four periods highlighted above. While there were some big moves in the S&P 500 in each of those years, there really wasn’t a whole lot in the way of a discernible trend. 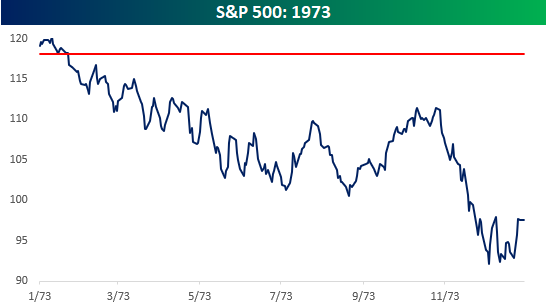 In 1973, equities just declined steadily throughout the year, falling over 15%. 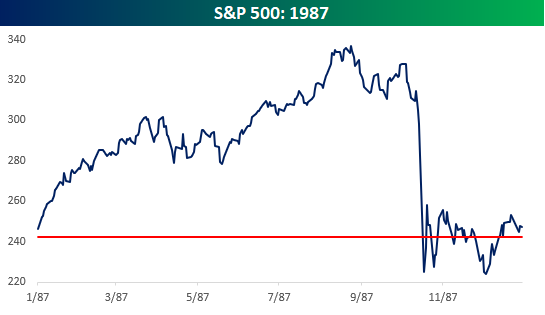 In 1987, they rallied sharply early in the year, only to crash in October and erase all of the prior YTD gains. 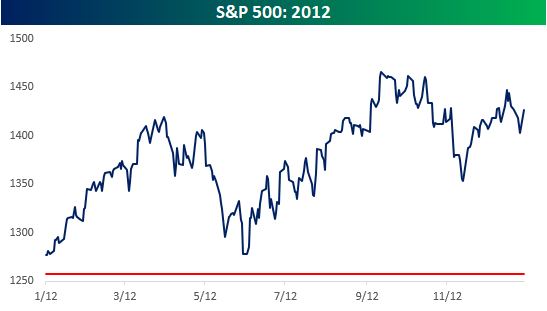 Then, in 2012, the S&P 500 rallied finishing the year with a respectable gain of 13.4%. One characteristic of each of the prior years shown, however, was there was more in the way of volatility than we have become accustomed to seeing recently. Even in 2012 when equities gained over 10%, the S&P 500 saw an intra-year decline of more than 10%.